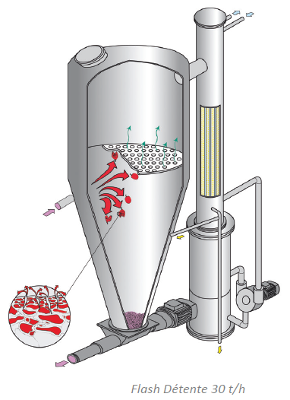 The 'flash détente' thermovinification process consists of a fast heat treatment, with the grapes brought up to high temperature, followed by immediate cooling by pressure reduction. The heat-treated grapes are fed into the vacuum chamber. This high vacuum chamber causes an almost instantaneous cooling of the grapes. The vapour generated is condensed. The condensates and the run-off juices are fed back into the pump. Control several presses from the same panel.